Ty Rattie's next appearance for the Blues will be his 14th in the NHL. 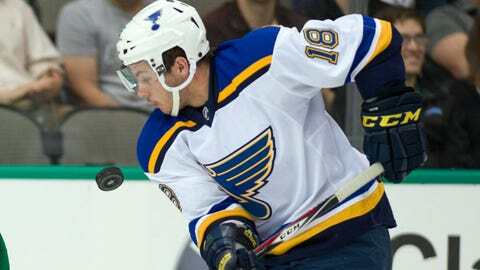 The St. Louis Blues recalled forward Ty Rattie from their American Hockey League affiliate, the Chicago Wolves, on Friday after forward Jaden Schwartz was injured at practice earlier in the day. The Blues reported that Schwartz collide with a goal post shortly after practice began Friday morning. He was taken to the hospital for further examination. "He shot the puck and then the puck bounced off," goaltender Brian Elliott said after practice. "He went to reach back for the rebound, kind of lost his edge and kind of came back into me and into the mesh of the net. … Hopefully, he’s all right." Schwartz has no goals and four assists through seven games this season. Rattie, 22, has dressed in three games for the Wolves this season, leading the club with four goals and seven points overall. The 6-foot, 189-pound forward was originally drafted by the Blues in the second round (32nd overall) of the 2011 NHL Entry Draft. He has made 13 career regular-season appearances with the Blues, logging two assists. The Blues already were dealing with the loss of several players to injury — forwards Paul Stastny, Robby Fabbri and Patrik Berglund and defenseman Kevin Shattenkirk.